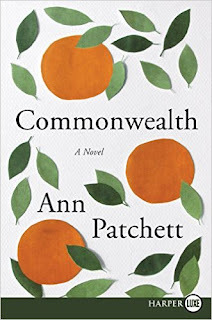 We met at Colette's home to discuss Janet's book choice Commonwealth by Ann Patchett. Present were Beth, Betty, Carla, Colette, Jane, Janet, Jolene, Michèle and Shirley. Colette served a very nice variety of cheese and crackers, stuffed mushroom caps, melon wrapped in proscuitto and wonderful sautéed shrimp. Red and white wine was served and afterwards, coffee, tea and a beautiful blueberry pie with ice cream. The first order of business was the 2016 "academy award" for the best book of the year. Six books were nominated but Carla's choice A Man Called Ove dominated with 5 of the 10 votes. Congratulations Carla! Here are some interesting facts about our Bookclub's reading this past year. We read a total of 9 books as per usual, for a total of 3 045 pages! We read six novels of which one is considered a classic (One Hundred Years of Solitude), and three non-fiction books. Four of our books were written by Canadian writers. 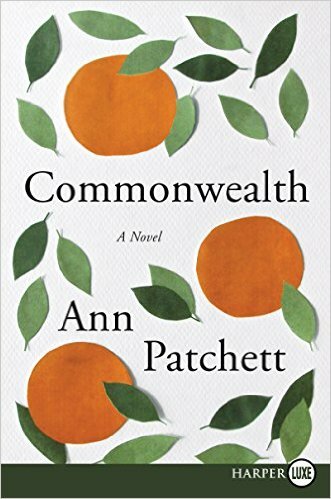 Janet gave us a short biography of Ann Patchett. She has written several books including Bel Canto that the Bookclub read in 2005. She is the recipient of numerous awards and fellowships including The Women's Prize for Fiction, previously known as the Orange Prize and now called the Bailey's Prize. She won for her book Bel Canto. Among many other prizes and fellowships she also received the Guggenheim Fellowship for creative arts in 1995. She has written seven novels and six non-fiction books. Ms. Patchett lives in Nashville and is co-owner of an independent bookstore called Parnassus Books. She is a big fan and promoter of independent bookstores. Commonwealth is the story of six siblings from two families and how they coped with negligent parents and shuttling back and forth from California to Virginia. The story develops over four decades and we learn how they coped as children and adults. A tragedy when the kids are young affects all the children and the adults. We learn more about the families when Frannie links up with a well known author and he writes a novel that is essentially the story of their families. The comments were mixed and not many of our members enjoyed the novel. However, several of us felt it was a good representation of the era when children were much freer to go out and explore the world. It is of course an exaggerated representation. The parents in this novel were extremely negligent. It is difficult to understand parents who would leave a child self-medicate and let a gun in an easily accessible place. Two of our members read the book twice and felt they could better connect the different parts of the story so that it made more sense. Some felt that it was implausable that children of two families would get along so well, but what bonded them was the hatred for their parents. It is a very sad story, a bit of a peek at a degenerative society of the '60s and '70s.